This is the story of Lazarus of Bethany when Jesus raised him from the dead. Jesus and Lazarus, and Lazarus sisters Mary and Martha were friends. Mary was the one who anointed Jesus feet and wiped it with her hair. So when Lazarus became sick Mary and Martha expected Jesus to come and heal him. named Lazarus, of Bethany, the town of Mary and her sister Martha. 3. Therefore his sisters sent unto him, saying, Lord, behold, he whom thou lovest is sick. This story of Lazarus of Bethany is a Bible lesson to demonstrate to the disciples and us that God is able to do the impossible. 4. When Jesus heard that, he said, This sickness is not unto death, but for the glory of God, that the Son of God might be glorified thereby. 5. Now Jesus loved Martha, and her sister, and Lazarus. 6. When he had heard therefore that he was sick, he abode two days still in the same place where he was. 11. These things said he: and after that he saith unto them, Our friend Lazarus sleepeth; but I go, that I may awake him out of sleep. 12. Then said his disciples, Lord, if he sleep, he shall do well. 13. Howbeit Jesus spake of his death: but they thought that he had spoken of taking of rest in sleep. 14. 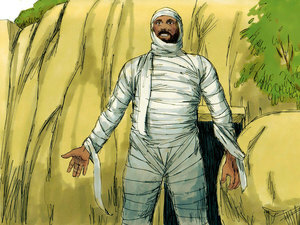 Then said Jesus unto them plainly, Lazarus is dead. 15. And I am glad for your sakes that I was not there, to the intent ye may believe; nevertheless let us go unto him. 17. Then when Jesus came, he found that he had lain in the grave four days already. 19. And many of the Jews came to Martha and Mary, to comfort them concerning their brother. 20. Then Martha, as soon as she heard that Jesus was coming, went and met him: but Mary sat still in the house. 21. 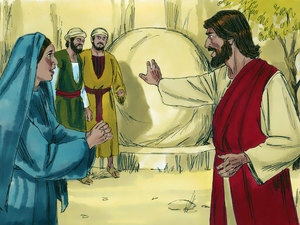 Then said Martha unto Jesus, Lord, if thou hadst been here, my brother had not died. 22. But I know, that even now, whatsoever thou wilt ask of God, God will give it thee. 32. Then when Mary was come where Jesus was, and saw him, she fell down at his feet, saying unto him, Lord, if thou hadst been here, my brother had not died. 23. Jesus saith unto her, Thy brother shall rise again. 24. Martha saith unto him, I know that he shall rise again in the resurrection at the last day. 26. And whosoever liveth and believeth in me shall never die. Believest thou this? 39. Jesus said, Take ye away the stone. Martha, the sister of him that was dead, saith unto him, Lord, by this time he stinketh: for he hath been dead four days. 40. Jesus saith unto her, Said I not unto thee, that, if thou wouldest believe, thou shouldest see the glory of God? 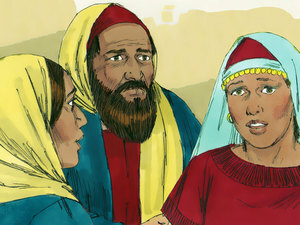 The story of Lazarus of Bethany also shows how Jesus relied on God the Father to perform miracles when he was on earth. 41. Then they took away the stone from the place where the dead was laid. And Jesus lifted up his eyes, and said, Father, I thank thee that thou hast heard me. 42. And I knew that thou hearest me always: but because of the people which stand by I said it, that they may believe that thou hast sent me. 43. And when he thus had spoken, he cried with a loud voice, Lazarus, come forth. 44. And he that was dead came forth, bound hand and foot with graveclothes: and his face was bound about with a napkin. Jesus saith unto them, Loose him, and let him go. 45. Then many of the Jews which came to Mary, and had seen the things which Jesus did, believed on him. The story of Lazarus contains the shortest verse in the bible. Click here if you have a question, comment, or suggestion. Didn't find what you were looking for? Use this search box to find it.